Google has announced a new In Apps search feature for Android, the feature will allow you to search for information within all of the different apps on your Android smartphone. The new feature lets you find content stored within these apps that are installed on your device, the feature is designed to make it easier to find what you are looking for on your device. 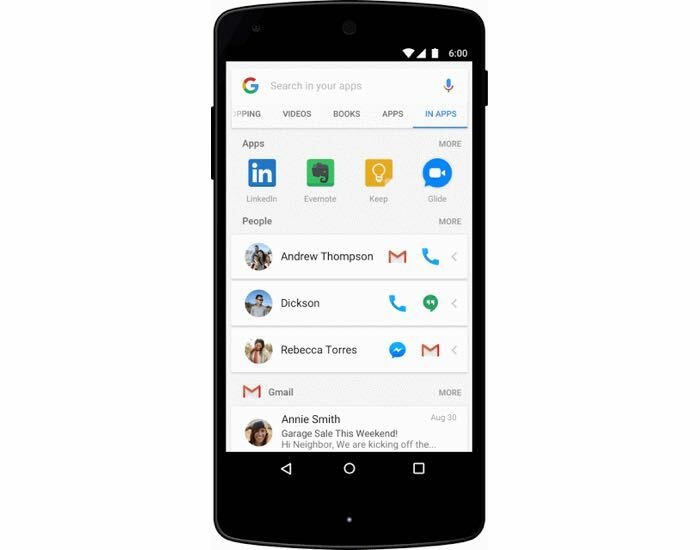 With this new search mode, called In Apps, you can quickly find content from installed apps. To access this feature, go to the Google app on your Android phone and find the In Apps tab. Today this experience works with apps like Gmail, Spotify and YouTube. In the coming months, we’ll also be adding more apps, including Facebook Messenger, LinkedIn, Evernote, Glide, Todoist and Google Keep. Searching your personal results happens entirely on your phone, so you can search even when you’re not connected to WiFi or cellular data. Only you can see your personal results, and you can control what apps appear by going to Settings within the Google app. You can find out more details about this new In Apps search feature on Android over at Google at the link below.